We do not curently have theatre tickets available for The Struts. This could be because we have simply sold out or it could be that this show is no longer running. The information on this page remains purely for historical and informational purposes. 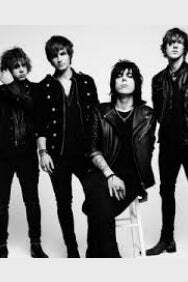 The Struts are a 4 piece indie rock band who formed in Derby in 2009. They have been described as a mix between Primal Scream and Hard-Fi. Their second album "Young & Dangerous" is out on 26th October 2018. Never ones to define themselves by a specific genre  the band can best be described as an eclectic mix of music's most heady influences; from anthemic floor stompers of 60's and 70's Rock n Roll to the heart-melting melodies of soul and catchy hooks of Motown classics.